When asparagus is in season, I can’t get enough of it. And that includes making this yummy cream of asparagus soup. While I’ll use asparagus as my vegetable for many a dinner, the soup itself is a perfect light dinner, maybe with a simple salad or crusty bread. And it also freezes well, so that I can make large batches and pull it out throughout the year. 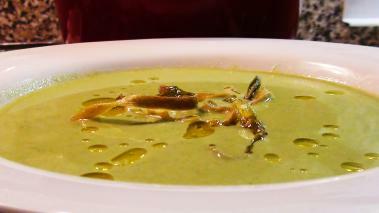 This cream of asparagus soup recipe is my basic version, which is very simple and quick to make. There are a ton of different ways to spin the recipe and I’d encourage you to experiment. Hope you enjoy it! Finally, taste as you cook. Especially for ingredients like salt, pepper, and the cream, the right amounts are variable based on personal tastes, and the only way to get them “right” is to add some, taste, and adjust. Asparagus is generally very hard to pair wine with. It tends to clash with the tannin in red wines and the oak in chardonnay. With the addition of the cream it makes pairing a bit easier. I’d suggest a lighter white with a good amount of acid, and perhaps a bit of sweetness, like a Riesling, or Gewurztraminer. Enjoy! Very good! Asparagus is one of my favorite vegetables, and this was perfect. I substituted escarole for the spinach, but other then followed the recipe and it came out great!